Audio files come in a number of different formats. Some are lossy, such as AAC and MP3; they save space compared to the original files, but some of the original data is lost during compression. Some formats are lossless, such as Apple Lossless, FLAC, and SHN; these files can be converted back to their original form without the loss of a single bit. Finally, some are uncompressed, such as WAV and AIFF; they represent the exact data from a CD or a master. 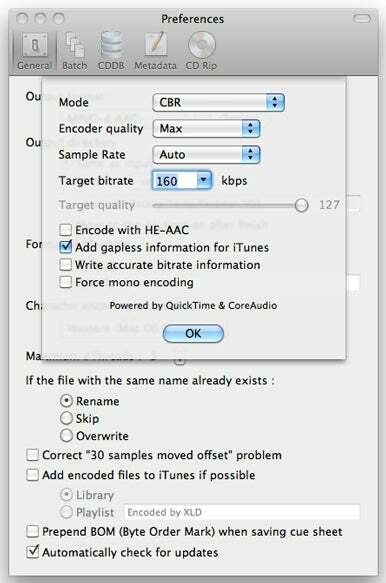 If you’ve bought music from the iTunes Store, you’ll have AAC files at 256 kbps (that’s kilobits per second, an indication of the quality of the compression; higher numbers are better). If you’ve purchased from Amazon, you’ll have MP3 files, most likely in VBR (variable bit rate compression), so the bit rate you see will be an average. Files from other sites may be in FLAC or even WAV format; the former is the most common for lossless files, notably from sites that sell live or classical music. There may come a time when you’ll want to convert some of your audio files to a different format. Depending on your originals, and the reason for the conversion, there are different ways you can do so. Even though this window says Import Settings, it's where you choose the settings to convert files. Find the files you want to convert and add them to a new playlist. Open iTunes’ preferences, click on the General icon, then click on the Import Settings button near the bottom of the window. This shows your current CD-ripping settings (which also apply to conversions made with iTunes). 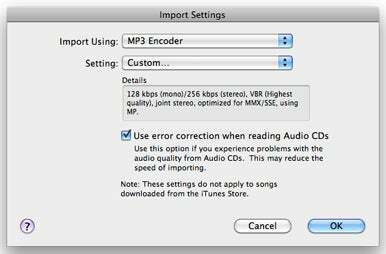 You can then make changes to these settings—for example, if you want to convert your files to MP3 format, choose MP3 Encoder from the Import Using menu. Choose a bit rate from the Setting menu. You should never choose a higher bit rate than your original files; your music won’t sound any better. But you can choose the same bit rate, so if you have 256-kbps AAC files from the iTunes Store, choose Custom from the Setting pop-up menu, and then set the Stereo Bit Rate pop-up entry to 256 Kbps to make sure you don’t lose any quality. (Converting from one lossy format to another will result in a very slight, but not noticeable, loss of quality.) Click OK several times to to save your settings and to close the Preferences window. 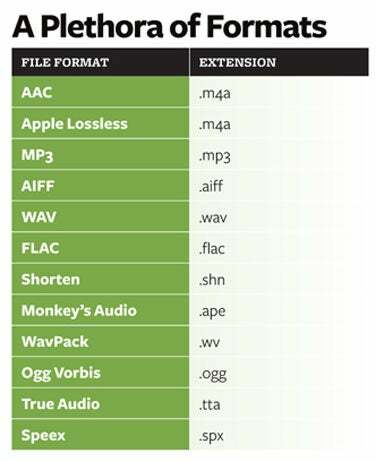 These are the most common formats for audio files. There are a large number of file formats (see the most common ones in the “A Plethora of Formats” table), many of which iTunes doesn’t support—notably FLAC, Shorten, and Ogg Vorbis. So what can you do if you have files in one of these formats and want to add them to iTunes? There are a number of programs that can convert audio files from one format to another. tmkk’s free XLD is my tool of choice, as it manages every audio file format I’ve ever come across, along with some I’ve never heard of, and even supports cue files. Stephen Booth’s free Max is another tool that converts many audio file formats. And if you have Roxio’s Toast 11 Titanium (and some earlier versions), you can convert from FLAC or Ogg Vorbis to iTunes-friendly formats. After choosing an output format, XLD lets you choose bit rate and other settings. If, for example, you’ve bought some music in FLAC format, and want to listen to them in iTunes, use XLD or one of the other programs to convert them to Apple Lossless; since both formats are lossless, you’ll have exactly the same data in the resulting files. (Converting from one lossless format to another does not result in any change in quality.) And you’ll retain any metadata in the original files as well. Once you’ve decided on what format you want to use, the bit rate and other settings, converting music files is a drag and drop (and wait) operation. With these tools, you’ll be able to convert any audio files into the format you need.